To conclude my posts on the views from five of London’s high view-points, here is one where my interest in obscure facts about London comes into play. 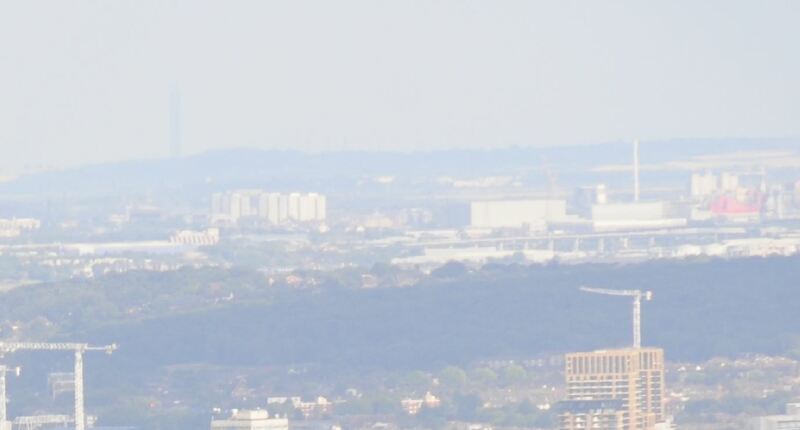 When standing at the top of the Shard, I wanted to know what is the furthest object visible from this height in central London. The first photo below shows what I believe was the furthest object. This is just visible with the naked eye and the conditions towards the east were good. I used my standard Nikon 18 – 200 lens at maximum to take these and they are clearer on my PC screen when not compressed for the Internet. If you look at the following photo, on the horizon on the left is the ghostly outline of a tower. This was the chimney at the Isle of Grain power station. The chimney was 801 feet high and a major landmark in north Kent and the Thames Estuary. I say was, as the chimney was demolished on the 7th September, a couple of weeks after I took these photos. (see the article at Kent Online for a video). So, at 34.58 miles I believe this was the furthest object visible from central London (please let me know if you know of another). All these power stations, including the one at the Isle of Grain, were powered by coal or oil and as such are all in the process of being decommissioned and demolished due to various directives to reduce emissions from the heaviest polluters used in electricity generation. At one time a whole string of power stations operated along the River Thames, including Lotts Road in Chelsea, Battersea, Greenwich (still a reserve power station) and along the Thames to the estuary. In the next couple of years, all the chimneys in the photo below will also have disappeared removing some striking landmarks from along the river. 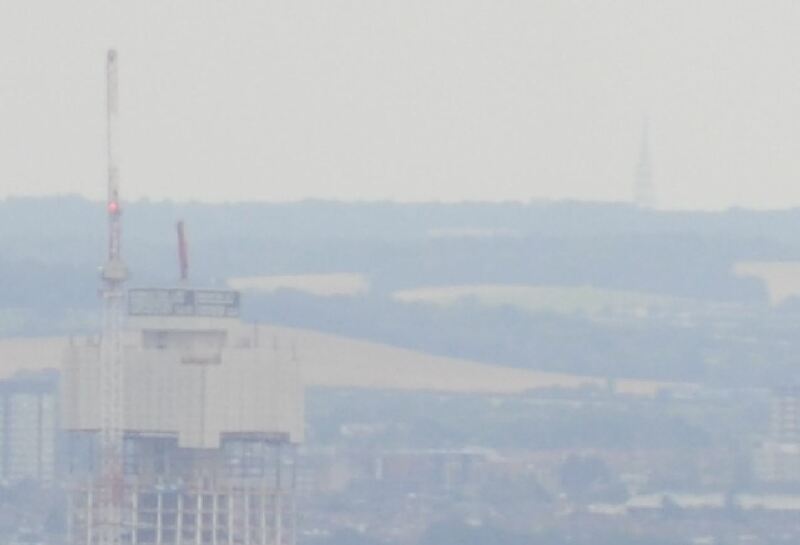 There is another object visible on the horizon that helps explain the original purpose of the BT Tower. Look at the following photo and the outline of a structure is visible on the horizon. This is a tower at Kelvedon Hatch, just north of Brentwood in Essex, built as part of a chain around the country to support a microwave radio communications network for telephone, TV and other more secure communications. The ring around London provided a link from the BT Tower to the rest of the country. Microwave radio signals travel by line of sight, so the antennas that transmit and receive these signals need to be high in order for the signal (which has a very narrow beam, similar to a visible laser beam) to pass across the country. The locations of these radio towers, including the BT Tower, were not originally marked on any maps, despite how obvious they were in the landscape and the amount of interesting looking antennae dishes covering the towers. It was an article in the Sunday Times magazine on the 28th January 1973 (which, sadly I still have) that published the details of the system, locations and photos of many of the towers across the country, that caught my very young interest in technology and infrastructure. Looking back through my photos from the Sky Garden, the tower is also visible from this lower location, which makes sense as the height of the BT Tower is 627 feet (with the antennas mounted lower), mush less than the Shard. There are other masts surrounding London which enabled the BT Tower to communicate with the rest of the country. These included the mast at High Wycombe, adjacent to the M40, and at Bagshot in Surrey. These should have been visible from the Shard, however I suspect lighting conditions were not ideal in these directions. The system has been redundant for many years, fibre cable in the ground providing a much more secure and efficient means of communicating than a network of large towers around the country, and the horn and dish antennas have been removed from the BT Tower. The masts now carry a mix of local commercial services, but they remain a reminder of the communications technology from over 50 years ago and of the original purpose of the BT Tower. If you know of any visible objects further than the Isle of Grain and Kingsnorth chimneys, I would be really interested to know. The views of London from the Monument, Sky Garden, St. Paul’s Cathedral, Shard and London Eye are excellent, but also take a look at the far horizon as there are also things to be seen that tell a story of both the Thames and London. This entry was posted in London Vistas and tagged Isle of Grain Power Station, Kingsnorth Power Station, The Shard, Tilbury Power Station on September 22, 2016 by admin. Thank you for this obscure experiment; I went up the Shard last year and wondered exactly the same thing but when I got home I forgot all about trying to work out what I’d taken pictures of. I read an article recently (on a site called Metabunk) about the Greenwich Meridian Laser where people were trying to find the most distant spot it is visible from and if it can be used to prove the curvature of the earth; this is another obscure experiment I look forward to others solving for me! Three very interesting posts! What a lot you got through that day. Yet another interesting and creative post. Thanks for your efforts! 34.58 miles, that’s impressive. And what luck to have spotted the chimney just before it breathed its last. Barnet church tower is open on Saturdays in July and August. It’s well worth the climb up the claustrophobic stairwell because the views are outstanding. 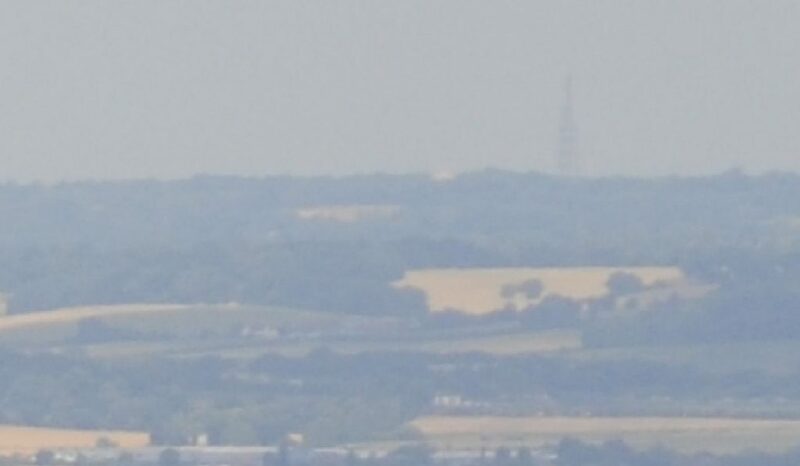 I have clocked Wrotham transmitter mast at 31 miles and St John’s church tower in Higham at 32.4 so not quite matching the feat we see here. I found it useful to manipulate the contrast and colour tint in Photoshop to bring out the fuzzy detail. Wrotham would have remained unspotted otherwise. I’ll have to revisit my Barnet photos now to find out if that “Grainy” chimney is visible. Pete, thanks for the information about Barnet church tower. That is one I will have to remember and visit next year. Good idea about Photoshop, I will have to try. Getting the sun in the right position really helps as well as lack of any haze in the atmosphere. Thanks Jan for your feedback, really appreciated.Interesting about your father, that was a good decision regarding the job. I agree it looks rather strange without the horn and dish antennas. The building was designed for these, so without them it rather lacks a purpose that matches the design. It is amazing to stand at the top of these buildings, there is so much detail to see and individual features to pick out. Greg, yes I agree. The sun was perfect for the Isle of Grain and Kingsnorth towers, I did look for the Stokenchurch and Bagshot towers but the lighting and contrast on the horizon was very poor. I will have to try again at a different time. Very interesting article and directly addresses a personal interest of mine, i.e the visibility of tall structures over large distances. A couple of years ago a high-resolution panoramic photo of London from the top of the Centrepoint Tower was doing the rounds online and the Grain chimney was clearly visible on that, which would add a couple more miles on. I may be alone in this but I think it’s a real shame that we are about to lose the majority of the remaining industrial landmarks from along the Thames Estuary with the demolition of the last major power stations. Back in the 70s and 80s that same view to the east would have been littered with giant chimneys – Belvedere Power Station, Littlebrook B, C and D Power Stations, West Thurrock Power Station, Northfleet Cement Works, Paper Mill and Power Station, Tilbury A and B Power Stations, Grain and Kingsnorth Power Stations. At least we’ll still have the giant pylons crossing the Thames at Thurrock as a monument to these times. Hi Rich – no you are not alone, I also think it will be a shame when all the large industrial landmarks have disappeared. I took a trip along the river last year in the Paddle Steamer Waveley and it was sad to see how much of the river is quiet and the closed power stations alongside. Good work, just a note on the microwave obsolency – microwave services are being re-used to connect up HFT trading operations between financial centres (London of course being one). See below for a press release on recently opened links London-Slough and London-Frankfurt. Fibre, whilst offering much better bandwidth, only runs at about 2/3rd c, whilst microwave can run at very close to c. This is before routing and physical distance, which microwave can also offer advantages on.